I was thrilled to get an email this week from Akiko Stehrenberger, the designer of my favorite movie poster of the last decade. She had been told by friends about her chart-topping appearance and agreed to do an interview for this column. Akiko is an illustrator and art director who lives in L.A. and has been designing movie posters since 2004. 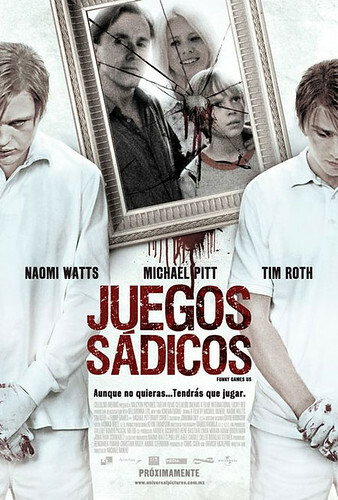 ADRIAN CURRY: First of all, the one thing I've always found most alluring about the Funny Games poster is that I’ve never been quite sure whether it’s an illustration or a photograph. AKIKO STEHRENBERGER: You are correct in not being sure. It is a digital illustration with a ton of noise on it to roughen it up. Warner Independent expressed interest in a certain scene from the film. We had such an incredibly limited budget that there were no resources to get a hi-res film grab. I literally sat at my personal computer and, in slow motion, chose a frame from the movie I thought would work best. I worked off a very tiny dvd screenshot, maybe 4"x4" and 72 dpi at best and used it as the base. With a background in illustration, and a stubborness for painting tangibly for many years, it was the first time I had decided to illustrate digitally, but I felt it was appropriate. CURRY: Did you want people to think it was an illustration or a photograph, or was that deliberately unclear? It always reminded me of a Photorealist painting, like an early Chuck Close. STEHRENBERGER: It sort of spontaneously took a life of its own. It was clear from the get go that the DVD screen grab was unusable as is. The client mentioned that we may eventually have access to a hi-res film pull, but I knew if I wanted it to have a chance, especially while being presented with a plethora of other polished posters by other designers, I knew I was going to have to put some serious magic into it. At first I was just going to try to retouch the screen grab blown up to a poster size, but clearly it was impossible. Next thing I knew, I became obsessed with digitally painting it, and it became what you see today. The look is what drew people to it. And while the client could have used the digital illustration as a place holder until there was eventual access to the film grab, it's the look the client ended up taking and running with. CURRY: As much as the image, I’ve always loved the spare use of type in the poster. Were you responsible for the whole design, including the typography, and did you have fights with the studio about keeping the type so minimal? STEHRENBERGER: I was responsible for the design, even though the first version had the type at the bottom. The stacking was influenced by Swiss graphic designer Josef Müller Brockmann, and a need to conserve space so the image could really do its thing. Luckily, the studio wasn't against its minimalism...which never happens. I was lucky to also have my creative director for that job, Jon Manheim, who is a major type enthusiast, to really fight for the type layout. CURRY: To backtrack a little, how did the commission come about and what was the process? Did you come up with other designs for the film? STEHRENBERGER: I was a freelancer art director at that time, and Crew Creative, who was my vendor for this particular job, had the relationship with Warner Independent. Jon Manheim, the creative director, approached me knowing that indie and dark/creepy imagery was sort of my forte at that time. I did come up with other designs for this job, including the acrylic illustration of the two men and their white gloves that I have on my website. 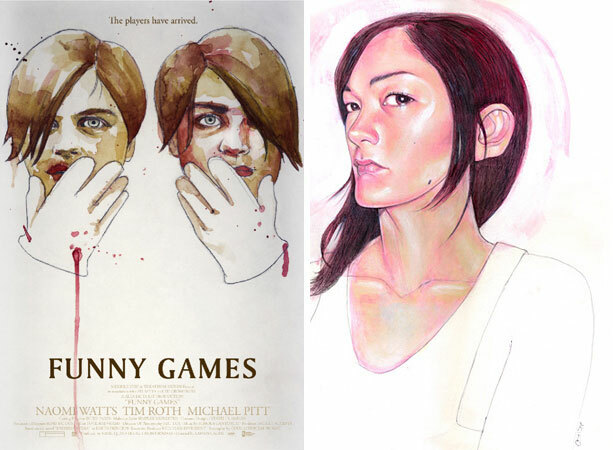 Above: Akiko's unused design for the poster, and a self-portrait. 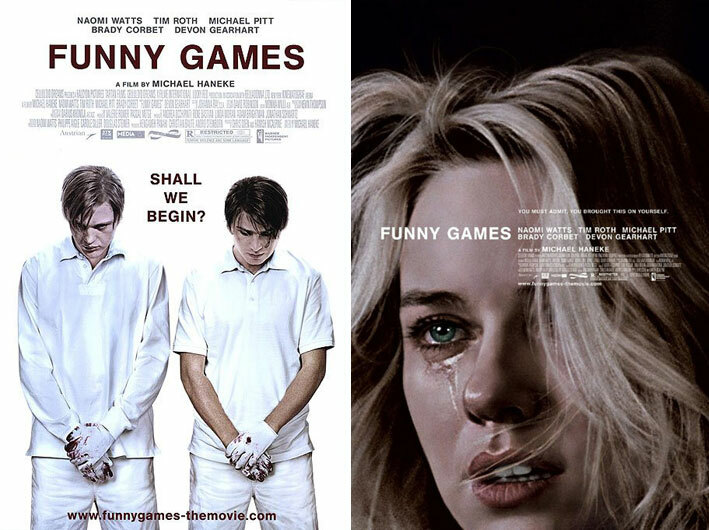 I fought really, really hard for Funny Games to come out the way it did. I don't think I ever fought harder for any of my designs. The client kept wanting to add something to it, like a gloved hand, or blood, and I believed strongly that it was strong enough and haunting on its own. I almost walked away from it entirely at one point, because I really felt adding something would take away its authenticity to the film and make it too “movie postery.” They also wanted me to build a sister piece with Tim Roth. Luckily, they realized the original was strong enough to survive on its own. And with that, we ended up with my favorite poster I created to date! CURRY: I have a vague feeling that I’ve seen the Tim Roth version somewhere, or did I just dream that? Was it ever made? STEHRENBERGER: I don’t think it ever made it to become one of the final posters. I did have to do a few versions of it, however. I was so relieved when they decided to nix it though, because I really felt the Naomi one stood strong on its own. CURRY: Was your poster used at the same time as the white poster with Michael Pitt and Brady Corbet or did one supercede the other? Or were they used in different markets? STEHRENBERGER: These both became the final posters and were completed around the same time. I think my Naomi one was released on IMPAWARDS first though to get some buzz. CURRY: Was the studio happy with the result and did the poster get much recognition when it first appeared? I remember seeing it quite prominently wild-posted in New York. Did you ever hear from Michael Haneke or Naomi Watts? STEHRENBERGER: I do think the studio was pleased with it, but I don’t think they realized how much buzz it would get. I wasn’t sure how people would react to it, but I knew I was very pleased to have had something go through in practically its original state, which is very rare. But when I got so many postings about it on IMP a few days later, I knew it had got some attention. I never heard from Michael Haneke or Naomi Watts directly, but through the process I knew Haneke was on my side and fighting for the poster to be true to the scene, minus an added gloved hand or blood on the face. It felt good to see that so many people were willing to fight for its integrity with me including my creative director, and Michael Haneke himself. Above: The poster for the Mexican market. An example of the more is less approach that Akiko successfully fought so hard against for her own design. CURRY: Has your poster won any awards? STEHRENBERGER: It was up for a Key Art Award last year, for best horror poster, but I think I lost to Saw V or something. CURRY: How long have you been designing movie posters and where did you get your start? STEHRENBERGER: I have been designing posters since 2004. I got my start when I first moved back to LA from NY. I had been working as a freelance editorial illustrator, and had some major debt racked up after continuing to live in NYC during and post 9-11. I originally approached Crew Creative advertising agency in hopes of becoming a sketch artist for photoshoot concepts. I was lucky that they saw something in me to become a designer and art director. I had never really used Photoshop prior because I was so adamant to be an illustrator that did everything by hand. I learned a tremendous amount in my two years as a full time art director at that company. After the second year, I decided to continue as a freelancer and work for many agencies including Crew Creative. CURRY: What is your favorite of your own designs (used or unused) apart from Funny Games? STEHRENBERGER: I had a lot of fun working on Flight of the Conchords, both season 1 and 2. 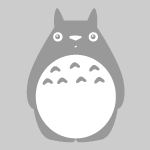 That is the ideal project for me. I also had fun on 500 Days of Summer. CURRY: What are you working on now? STEHRENBERGER: I wish I could let you know, but it’s confidential until the movies come out! Sorry! This is awesome, great interview! Akiko, I admire your honesty and how open you are in giving us the behind the scenes details. It’s not often you get to really know the designer who worked on a poster because the credit is given to the agency. So thank you Adrian for reaching out to her and doing this interview. One of my favorite all time posters. It’s also encouraging that Akiko, a traditional illustrator, was hired by the agencies during this day and age. That’s good news for other freelance illustrators and designers who hoping to design film posters. Thanks again. Very enjoyable interview – it’s nice to see some of the unused designs, and how much work and love goes into the process. Thank you. Who let the dogs out? Akiko. Nice, I’m a Graphic Design major myself, so this would be a dream job for me. When I first saw that poster it was magnetic! Great stuff @ The Auteurs, keep it up.